Volcanoes are like the heart – hot, flowing, sometimes explosive, simultaneously destructive and creative, untamed, unstoppable, picturesque. Volcanoes provide a channel for deeply buried molten rock to find its way to the surface. Sometimes the eruption is effusive – gently covering the earth with super-heated rock. Sometimes the eruption is explosive, creating glowing avalanches of gas and ash that suffocate, mudslides that bury, and shock waves that kill. Passion is, by nature, unpredictable. Though the ego would try to tame and control the heart, the heart remains present, even if hidden under the overburden of thought. As the biological heart pumps blood throughout the body, nourishing the cells, the human heart nourishes the soul by enhancing creativity, inflaming passions without judgment, and allowing expression without categorization. People can dwell in our hearts. 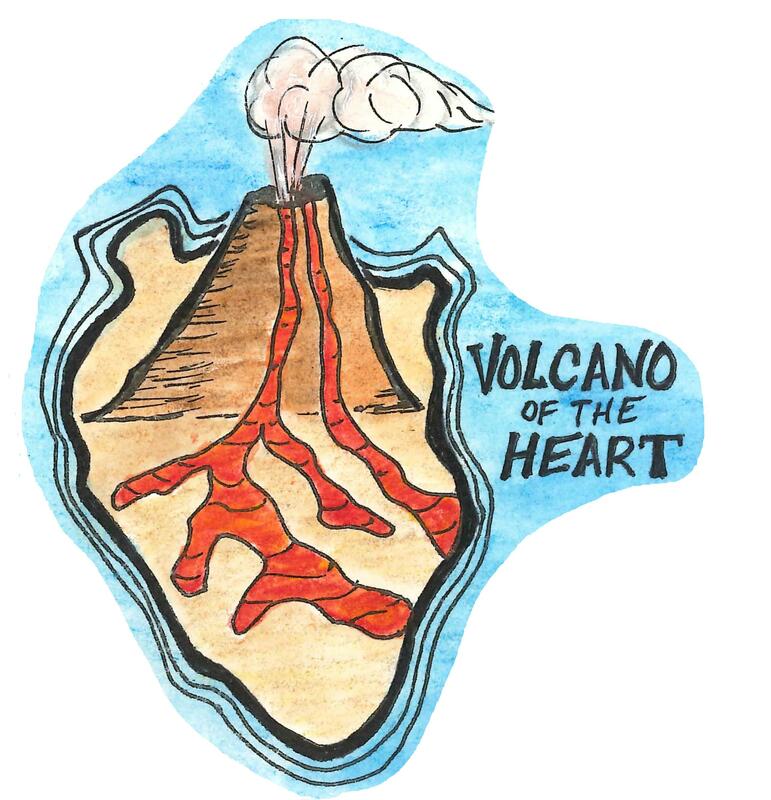 Some act like volcanoes in our lives – creating conduits for our creativity and passion to finally reach the surface. Often, these alchemists see who we really are, beneath the overlying layers, more clearly than we see ourselves. Others entrench themselves in us – often destructively – leaving us to wish the ghost of them would leave. What does your heart yearn to express? What is blocking your creative flow? Who do you love? What do you love? Who do you let into your heart? What blessings have these beings brought? What damage have they done? How have you been altered? Who do you block from your heart? What creative projects or passions would you like to cultivate? How do you stop to listen to your soul? Who would you be without the “shouldn’ts”, “can’ts” and “why bothers.”? If you could do one thing, right now, to nurture your heart, what would that be? Who would you share this experience with? Why? These images of the heart were created by students in the Hutchins School of Liberal Studies at Sonoma State University. My deepest gratitude to them for sharing their hearts with us.